Ah, a beautiful summer afternoon. You have a chilled drink and a good book, and you are happily relaxing underneath your gorgeous wooden pergola. Everything is perfect, except that the sun has just dipped to the point in the sky that it is shining right into your eyes no matter how you hold your head. Sure, you could turn your chair around, or (gasp) go back inside, but there is no need to take drastic measures…just close your pergola curtains. We’re the first to admit it’s an unusual idea, but that doesn’t mean it’s not a good one; and we know that our curtain tracks and drapery hardware have many uses beyond covering windows or sliding a divider around a hospital bed. 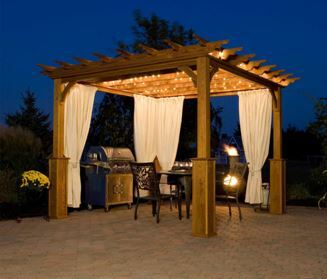 Well-chosen tracks and pergola curtains can change a lovely, but ordinary, pergola into a luxurious outdoor area with a cabana feel that is great for summer entertaining. You’ve already gone to the work and expense to have this beautiful space outside – why not go the extra mile to make it truly spectacular? A ceiling-mounted curtain track such as our 32124 Low Profile Ceiling Mount Curtain Track can be installed into any of the horizontal beams that suits your need. It is available in multiple lengths and doesn’t require brackets (i.e. it is drilled directly into the beam). A track such as our 6100 Flexible Curtain Track can be bent by hand without compromising strength, to go around the perimeter of the whole structure. Any track you use will allow you to hang practical light-blocking panels or mosquito netting, but there are also style possibilities. Colorful curtains will liven up the area; rich textures will add to the luxurious feel. A couple of sheer panels flowing in the breeze will give an exotic feel, and custom tie-backs add a touch of elegance, as can be seen in this week’s photo found on Pinterest. We would love to help you pick the right tracks for hanging pergola curtains. Give us a call at 888-434-7444 and our knowledgeable sales staff will be happy to talk with you. This is a dream of every human being to hold a candle light dinner with his/her dearest one at this spot because this place is looking so beautiful with candles in the summer night and Curtains plays an important part in this. You all can transform your own place to a dream place by following this blog. Thanks a lot for sharing this.